The Metro service in the city of Kharkiv, the second largest city in the country of Ukraine, became the second network of its kind in the nation following the Kiev Metro Network. It opened in the year 1975 and was the sixth such service to commence operations in the former USSR region. There are three lines in operation as part of the service which runs on a track length of thirty eight kilometers and is served by twenty-nine stations. The Metro service in the city makes for the easiest and fastest means of travelling around Kharkiv. As the most convenient means of public transportation in this Ukrainian city, it transports nearly one million commuters regularly. The service has three lines in operation, namely the red, green and blue lines. The route design of the Kharkiv Metro is such that upon entering the Metro station, you can decide which route you want to take to reach your destination. If in doubt, you can always ask the police officer or any of your co-passengers for guidance. Travelling by the Metro service in Kharkiv is safe even in the late hours of night but it is advisable that you keep an eye on your personal belongings while travelling in an overcrowded carriage. Map of Kharkiv Metro showing its lines and stations. 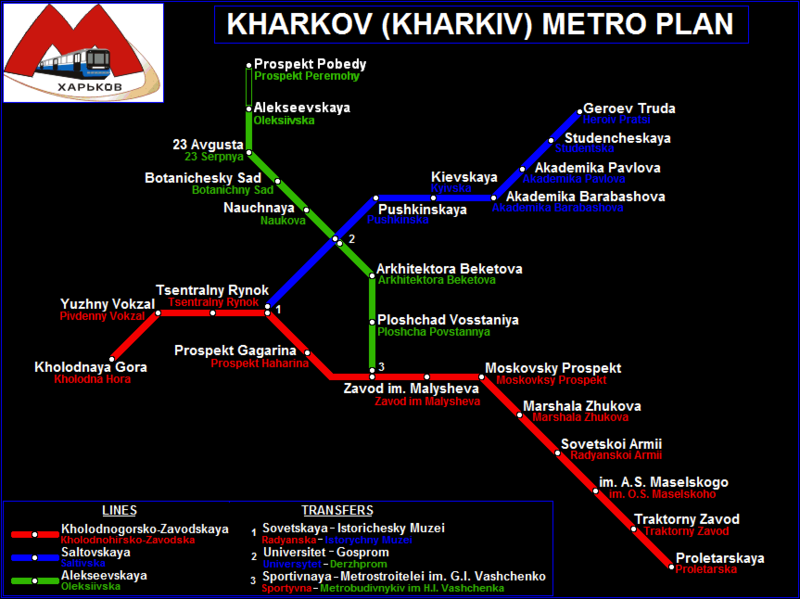 Click on the map to enlarge it or Download Kharkiv Metro Map in PDF. In order to enter the service premises, you will be required to purchase a token from the cash desk (traditionally referred to as Kassa). In many places, these have been replaced by automats that are placed at the entrances to the stations. Irrespective of the distance of travel and the duration, a token will be valid for only one trip. While putting your token into the turnstile, ensure that you place it on the right side else you will be hit by a rebounding metal gate. The fare is just 2 UAH. In case of breach of the rules of the metro, you are in the hands of the Ukraine Law. Passengers are requested to help elders and prevent the situation where a child is let alone on the elevator. Passengers are prohibited to enter the metro under the influence of any toxic substance. Photography and videography is prohibited. Kharkiv Metro operates between 05:30-00:00, midnight.